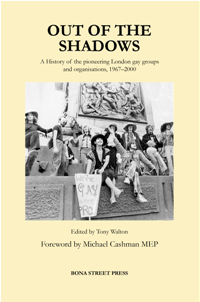 Many members of SLAGO and other organisations have been collaborating on the book Out of the Shadows , a history of the pioneering London gay groups and organisations, 1967–2000, edited byTony Walton, with a foreword by Michael Cashman MEP. ISBN 978-0-9566091-0-6. 250 pages, 74 illustrations. The book was formally launched at the Annual Conference of the Campaign for Homosexual Equality (CHE), 4 July 2010. CHE held a reunion for everyone concerned with the book in November 2010. If you were unable to attend, but would like to get in touch, please contact reunion@foxearth.demon.co.uk. Out of the Shadows is published by Bona Street Press, BM Box 7128 London WC1N 3XX. You can buy this book via Lulu for £11.50 plus postage and packing,and it's also available at Gays the Word bookshop; alternatively e-mail tsbbooksearch@hotmail.com for further details. The initial print run has now sold out, and we've reprinted the book with a few corrections. See below for reemaining errata, and groups that didn't get included. and for gay groups throughout London see LGBT London – www.lgbtlondon.com – and for LGBT history generally see the new wiki at www.lgbthistoryuk.org. Since the book was published, we've started to hear about some other groups, including the London Gay Teenage Group: see Gary James's tribute to Philip Cox, one of its founders. Outrage! didn't quite fit in with our original scheme, being mainly campaigning rather than social, but we were interested to see that their re-launched website includes a lot of material from their 20-year history. On Page 2 of the book we promise to put amendments and corrections on this website. We've found (or been notified of) a few, so far - see our Errata page. Currently we think we've corrected all the known errors in the reprint – see the page of changes between this and the original print run.